This slow cooker spiced chicken stew is so good that I’ve already made it twice over the course of three days. It is incredibly flavorful and has the comforting qualities of homemade chicken soup. Plus, it’s super easy to throw together too. I think it’s going to be on repeat through the fall and winter! Meanwhile, Jesse and I are getting ready to depart Wednesday evening for LA, where we’ll reside for 10 days to complete a week-long training with Jill Miller of Yoga Tune Up. We’re excited, but a little nervous too! UPDATE: Watch the replay HERE of me making this recipe on KATU Afternoon Live on January 9, 2016! 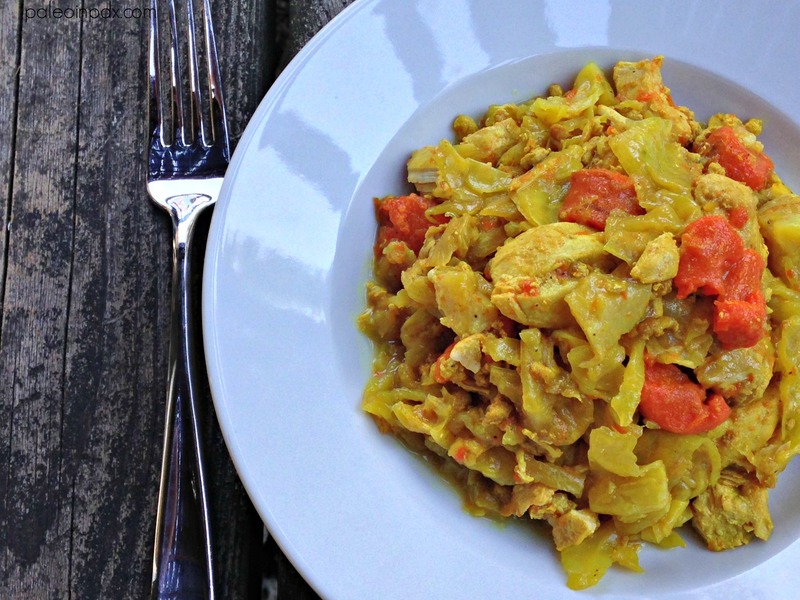 This slow cooker chicken stew with cabbage, carrots, turmeric and cumin makes for an incredibly savory and comforting meal. Melt butter or ghee in a large pan over medium heat. Add the onion and carrots, and stir to coat. After a minute, add the chicken pieces and 1 tsp of the sea salt. Continue to cook until the chicken is mostly browned, but still has some pink to it. Pour chicken mixture into the slow cooker with the cumin, turmeric, remaining 1 tsp sea salt, black pepper and cabbage. Stir well. Place lid on slow cooker and let cook on low for 4-5 hours. If you're home, I recommend stirring halfway through the cooking time, but it's not critical and nothing to fret over if you can't do so. I've since tried this recipe with the addition of sweet potato and also really like it that way (if using, add to slow cooker with the cabbage and spices). I've used one medium-large sweet potato and found that it was enough. This was a great meal. The flavors are indeed very reminiscent of chicken noodle soup. I cooked it over the stove for an hour rather than using a slow cooker, adding a little water once, and it turned out beautifully. I chopped spinach and pour this over it – filling, delicious, and very healthy! Thank you for trying it out, Maggie! I’m so glad you enjoyed it and made it work on the stove. I actually made this for dinner again today. I’m kinda hooked! What setting for slow cooker, high or low (for 4 hours)? Oops, left that out somehow, but updated it now. Cook on low for 4 hours since it’s already cooked some on the stove. Hope you enjoy it, Linda!